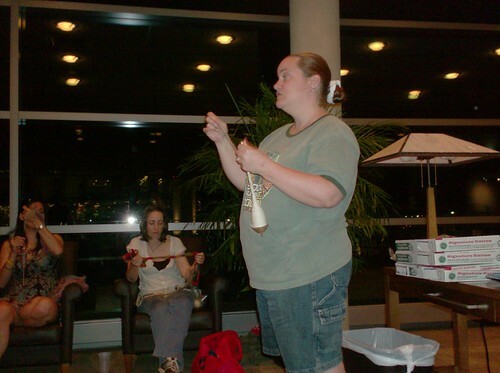 Last Wednesday, Abby Franquemont came to OSU to give us a spinning workshop. This is the biggest event our knitting club has held in several years, and it was definitely a success! We all learned a lot, even the veteran spinners among us. Abby is great to work with, really nice and fun to talk to. She spent some of her childhood in Peru, where her anthropologist parents were doing fieldwork. That's where she learned to spin at the age of 5. She speaks Spanish and Quechua, and knows tons about traditional spinning practices in an area where spinning is still an extremely common activity. She's a real spinning expert, and the author of Respect the Spindle. Our group was mixed, from people who had never seen a spindle before, to people who tried to spin but gave up, to regular spinners. 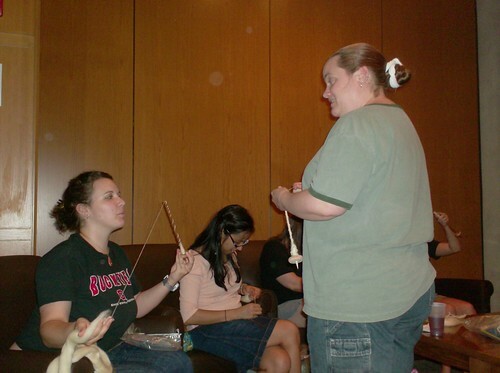 Everyone came out of it with a much better understanding of spinning yarn than they had before. The workshop was really useful for me. Even though I've been spinning for a couple years now, I'm pretty much self-taught. I think I was the first one in my knitting group to learn to spin, and I took my lessons from articles and videos online. Since there was no one there to teach me when I first learned, I've picked up a few odd habits (the same thing happened with my knitting). Though not all quirks are bad, some of these things hold me back from becoming a better spinner. So, I went in to the class with a fresh mindset, prepared to learn how to spin all over again. Abby was great at answering questions and really getting us to understand the whys and wherefores of spinning. She pointed out good and bad technique among us, and why doing one thing was better than doing something else. Besides learning how to spin on a low-whorl spindle (no hook! shock! horror! ), I came out of the class with a greater understanding of spinning itself. It was a really fun time, and I think it was really valuable.